The price reflects one item.This item must be purchased in multiples of 2. 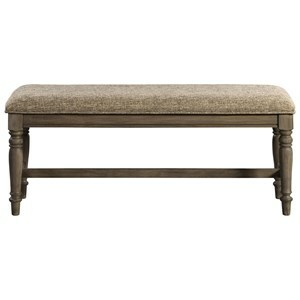 Create a more casual gathering space and pack extra seating into a smaller dining area with bench seating. A great option for seating smaller children, bench seating can keep your dining space looking neat instead of constantly pushing in chairs. Use a combination of chairs and a bench or two to update your dining room with a neat and organized gathering space that fits your home and your needs. 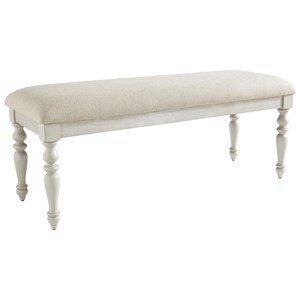 Let people closely gather together at your table with this welcoming upholstered dining bench. 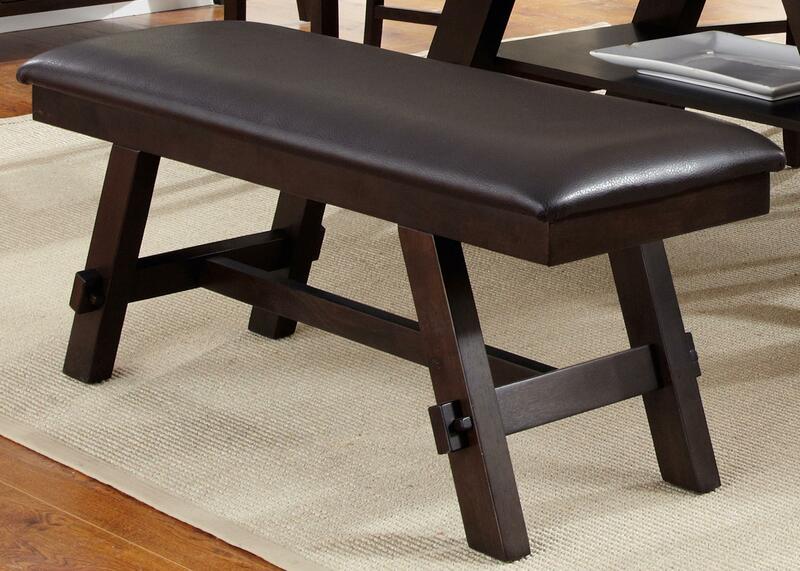 This bench shows off angular legs and is a different approach to dining seating. The chocolate colored upholstery is accented by the dark espresso finish of the base, creating a warm and approachable atmosphere in your dining room. Use with a rectangular table and transitional side chairs to complete your dining room. 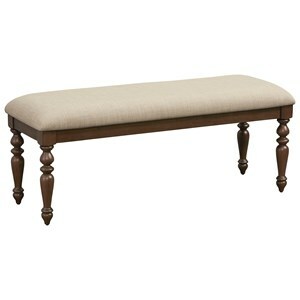 The Lawson Upholstered Dining Bench by Sarah Randolph Designs at Virginia Furniture Market in the Rocky Mount, Roanoke, Lynchburg, Christiansburg, Blacksburg, Virginia area. Product availability may vary. Contact us for the most current availability on this product. Warranty Manufacturers warranty is one year from the date of invoice. The warranty will not apply to damage arising from neglect, accidental or intentional damage, freight damage, institutional or commercial use, exposure to extreme sunlight, temperature, moisture or humidity. 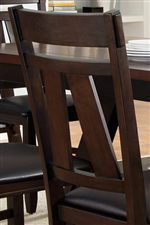 The Lawson collection is a casual dining collection that will show off your transitional style in your dining room. Pieces have two-tone finishes of dark and light espresso making them warm and inviting. Butterfly leaves are used on the tables to create more space to seat your friends and family. A UV top coat is used on table tops to protect them from scratches and marring, for a timeless, flawless appearance. Bench options in the collection help make your dining room one of a kind with the option to mix and match a bench with side chairs for ample dining seating. 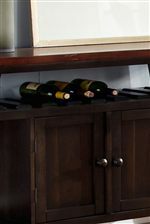 Storage is provided in the shelf on the table as well as in the server with wine storage, open shelves and a door with an adjustable shelf. 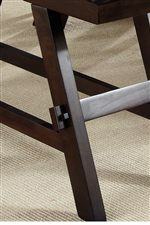 Pieces feature angular legs and horizontal lines, giving the whole collection simple, clean edges. Together these pieces create an effortless, transitional dining set that is sure to fit your style and home. The Lawson collection is a great option if you are looking for furniture in the Rocky Mount, Roanoke, Lynchburg, Christiansburg, Blacksburg, Virginia area. 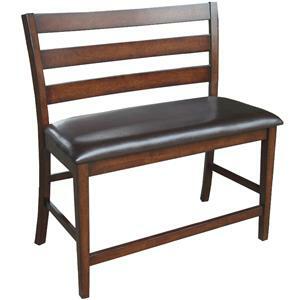 Browse other items in the Lawson collection from Virginia Furniture Market in the Rocky Mount, Roanoke, Lynchburg, Christiansburg, Blacksburg, Virginia area.